A sanitary sewer or "foul sewer" is an underground carriage system specifically for transporting sewage from houses and commercial buildings through pipes to treatment or disposal. Sanitary sewers are part of an overall system called sewerage or sewage system. Separate sanitary sewer systems are designed to transport sewage alone. In municipalities served by sanitary sewers, separate storm drains may be constructed to convey surface runoff directly to surface waters. Sanitary sewers are distinguished from combined sewers, which combine sewage with stormwater runoff in the same pipe. Sanitary sewer systems are considered beneficial because they avoid combined sewer overflows. Sewage treatment is less effective when sanitary waste is diluted with stormwater, and combined sewer overflows occur when runoff from heavy rainfall or snowmelt exceeds hydraulic capacity of sewage treatment plants. To overcome these disadvantages, some cities built separate sanitary sewers to collect only municipal wastewater and exclude stormwater runoff collected in separate storm drains. The decision between a combined sewer system or two separate systems is mainly based on need for sewage treatment and cost of providing treatment during heavy rain events. Many cities with combined sewer systems built prior to sewage treatment have not replaced those sewer systems. Interior photo of a large sanitary sewer from an access manhole. In the developed world, sewers are pipes from buildings to one or more levels of larger underground trunk mains, which transport the sewage to sewage treatment facilities. Vertical pipes, usually made of precast concrete, called manholes, connect the mains to the surface. Depending upon site application and use, these vertical pipes can be cylindrical, eccentric or concentric. The manholes are used for access to the sewer pipes for inspection and maintenance, and as a means to vent sewer gases. They also facilitate vertical and horizontal angles in otherwise straight pipelines. Pipes conveying sewage from an individual building to a common gravity sewer line are called laterals. Branch sewers typically run under streets receiving laterals from buildings along that street and discharge by gravity into trunk sewers at manholes. Larger cities may have sewers called interceptors receiving flow from multiple trunk sewers. Design and sizing of sanitary sewers considers the population to be served over the anticipated life of the sewer, per capita wastewater production, and flow peaking from timing of daily routines. Minimum sewer diameters are often specified to prevent blockage by solid materials flushed down toilets; and gradients may be selected to maintain flow velocities generating sufficient turbulence to minimize solids deposition within the sewer. Commercial and industrial flows are also considered, but diversion of surface runoff to storm drains eliminates wet weather flow peaks of inefficient combined sewers. Pumps may be necessary where gravity sewers serve areas at lower elevations than the sewage treatment plant, or distant areas at similar elevations. A lift station is a gravity sewer sump with a pump to lift accumulated sewage to a higher elevation. The pump may discharge to another gravity sewer at that location or may discharge through a pressurized force main to some distant location. Effluent sewer systems, also called septic tank effluent drainage (STED) or solids-free sewer (SFS) systems, have septic tanks that collect sewage from residences and businesses, and the effluent that comes out of the tank is sent to either a centralized sewage treatment plant or a distributed treatment system for further treatment. Most of the solids are removed by the septic tanks, so the treatment plant can be much smaller than a typical plant. In addition, because of the vast reduction in solid waste, a pumping system can be used to move the wastewater rather than a gravity system. The pipes have small diameters (typically 1.5" to 4"). Because the wastestream is pressurized, they can be laid just below the ground surface along the land's contour. Simplified sanitary sewers consist of small-diameter pipes (typically 100 mm or about 4 inches), often laid at fairly flat gradients (1 in 200). The investment cost for simplified sanitary sewers can be about half the cost of conventional sewers. However, the requirements for operation and maintenance are usually higher. 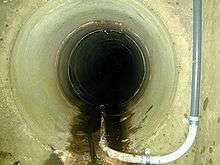 Simplified sewers are most common in Brazil and are also used in a number of other developing countries. In low-lying communities, wastewater may be conveyed by vacuum sewer. Pipelines range in size from pipes of six inches (150 mm) in diameter to concrete-lined tunnels of up to thirty feet (10 m) in diameter. A low pressure system uses a small grinder pump located at each point of connection, typically a house or business. Vacuum sewer systems use differential atmospheric pressure to move the liquid to a central vacuum station. The maintenance requirements vary with the type of sanitary sewer. 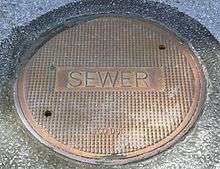 In general, all sewers deteriorate with age, but infiltration/inflow is a problem unique to sanitary sewers, since both combined sewers and storm drains are sized to carry these contributions. Holding infiltration to acceptable levels requires a higher standard of maintenance than necessary for structural integrity considerations of combined sewers. A comprehensive construction inspection program is required to prevent inappropriate connection of cellar, yard, and roof drains to sanitary sewers. The probability of inappropriate connections is higher where combined sewers and sanitary sewers are found in close proximity, because construction personnel may not recognize the difference. Many older cities still use combined sewers while adjacent suburbs were built with separate sanitary sewers. For decades, when sanitary sewer pipes cracked or experienced other damage, the only option was an expensive excavation, removal and replacement of the damaged pipe, typically requiring street repavement afterwards. In the mid-1950s a unit was invented where two units at each end with a special cement mixture in between was pulled from one manhole cover to the next, coating the pipe with the cement under high pressure which then cured rapidly, sealing all cracks and breaks in the pipe. Today, a similar method using epoxy resin is used by some municipalities to re-line aging or damaged pipes, effectively creating a "pipe in a pipe". 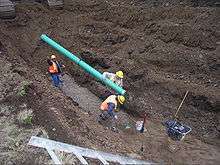 These methods may be unsuitable for locations where the full diameter of the original pipe is required to carry expected flows, and may be an unwise investment if greater wastewater flows may be anticipated from population growth, increased water use, or new service connections within the expected service life of the repair. Another popular method for replacing aged or damaged lines is called Pipe bursting, where a new pipe (typically PVC or ABS) is drawn thru the old pipe behind an "expander head" that breaks apart the old pipe as the new one is drawn through behind it. Sanitary sewers evolved from combined sewers built where water was plentiful. Animal feces accumulated on city streets while animal-powered transport moved people and goods. Accumulations of animal feces encouraged dumping chamber pots into streets where night soil collection was impractical. Combined sewers were built to use surface runoff to flush waste off streets and move it underground to places distant from populated areas. Sewage treatment became necessary as population expanded, but treatment of diluted waste from combined sewers is more expensive than treating undiluted sewage. ↑ U.S. Environmental Protection Agency (EPA), Washington, D.C. (2004). "Report to Congress: Impacts and Control of CSOs and SSOs." August 2004. Document No. EPA-833-R-04-001. ↑ Metcalf & Eddy, Inc. (1972). Wastewater Engineering. (New York: McGraw–Hill.) p.119. ↑ "The History of Toilets". Mary Bellis. Retrieved 2013-12-16.